Nominated by Franklin D. Roosevelt on December 1, 1941, to a seat vacated by Hugh D. McLellan. Confirmed by the Senate on December 16, 1941, and received commission on December 19, 1941. Served as chief judge, 1965-1971. Assumed senior status on September 1, 1971. Service terminated on September 3, 1986, due to death. Irons, Peter H. The New Deal Lawyers. Princeton, N.J.: Princeton University Press, 1982. My years with Ropes and Gray, 1984. 53 pages; photocopy of typewritten text dated January 25, 1984, with photocopies of four pages of correspondence between Wyzanski and Archibald Cox discussing Wyzanski's reminiscences. 4 linear ft. (ca. 1,600 items); finding aid; collection contains personal and professional correspondence, legal briefs, memos, and other legal documents. Wyzanski, Charles Edward, Jr. "Charles E. Wyzanski, Jr." Interview conducted on May 7, 1984, by Terry L. Birdwhistell. Stanley Forman Reed Oral History Collection, Special Collections and Archives, University of Kentucky, Lexington, Kentucky, 1984. 45 minutes. Wyzanski, Charles Edward, Jr. "The Reminiscences of Charles E. Wyzanski." Interviews conducted on July 12-13, 1954, by Harlan B. Phillips. Oral History Research Office, Butler Library, Columbia University, New York, 1954. Transcript, 321 pages. 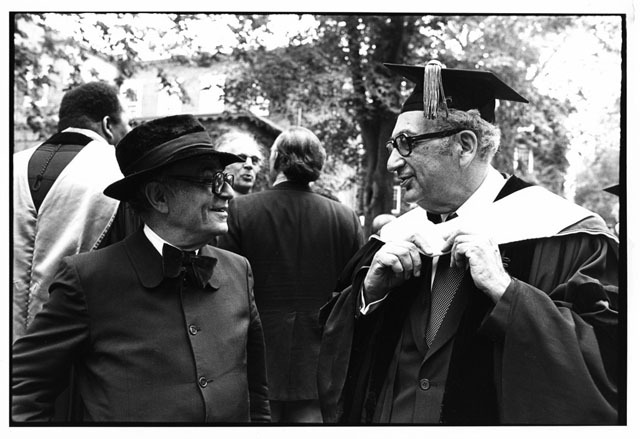 Paul Freund and Charles E. Wyzanski, Jr. [left] at Harvard University's 350th anniversary celebration; artist unknown; Photograph; 1986; Paul A. Freund Visuals Collections, Harvard Law School Library, Cambridge, Mass., record identifier: olvwork368858. Reference image courtesy of Historical & Special Collections, Harvard Law School Library. Further reproduction prohibited without permission of the library.